This second edition of Compact Numerical Methods for Computers presents reliable yet compact algorithms for computational problems. As in the previous edition, the author considers specific mathematical problems of wide applicability, develops approaches to a solution and the consequent algorithm, and provides the program steps. He emphasizes useful applicable methods from various scientific research fields, ranging from mathematical physics to commodity production modeling. While the ubiquitous personal computer is the particular focus, the methods have been implemented on computers as small as a programmable pocket calculator and as large as a highly parallel supercomputer. The accompanying software (available by coupon at no charge) includes not only the algorithm source codes, but also driver programs, example data, and several utility codes to help in the software engineering of end-user programs. The codes are designed for rapid implementation and reliable use in a wide variety of computing environments. Scientists, statisticians, engineers, and economists who prepare/modify programs for use in their work will find this resource invaluable. Moreover, since little previous training in numerical analysis is required, the book can also be used as a supplementary text for courses on numerical methods and mathematical software. 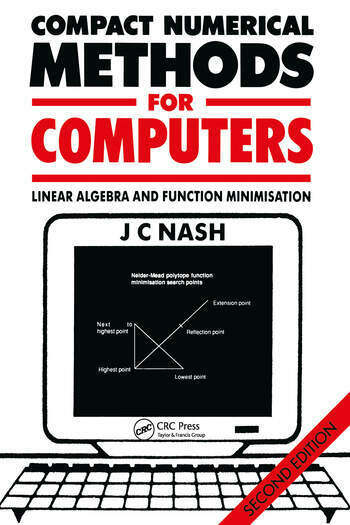 "Anyone who must solve complex problems on a small computer would be well advised to consult Nash's book for both ideas and actual procedures. Those with the luxury of a large-scale computer for their numerical work will also find much of interest here."